Portrayer: Leora Dana, October 13, 1978 - November 14, 1979. Introduction Scene: To Liz Matthews after entering Mac's office, "I was told to come right back." Exit Scene: To Dennis Wheeler, who was about to drive her to the airport, "Why don't you wait until I powder my nose?" Date Of Death: October 1988. 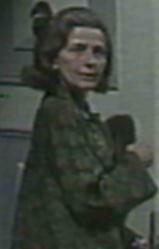 Other Aliases: Sylvia Kosloff (real name). Other Whereabouts: New York City. Relatives: Iris Wheeler, daughter. Myrtle Benson, sister. Dennis Wheeler, grandson. Sarah Matthews Wheeler, great-granddaughter. Medical History: Had a mild drinking problem. Legal History: Convicted of killing a man who raped her when she was a young adult. Former Occupations: A model in her youth. Cut-rate-clothes designer. Owner of Sylvie Dresses.